Want to come and get your hands into fermenting? Have you watched lots of times and are still too scared to make it yourself? Or do you think it looks to hard? Want to see just how EASY it is to make???? We show you how to do the lot and get you to have a go at doing it yourself in an environment where you can ask loads of questions and have hands on experience. On this day you will have everything you need to get started, and run through this easy process so you can feel confident to do this in your own home. Confident to grow your own probiotic and ferment vegetables. Gut health is fast becoming the way to increase immunity, happiness and health in our lives. More and more scientific evidence is becoming available to us and the more you read the more you see how important pickling your own vegetables and growing your own probiotic is becoming. ​It's so EASY to make Kim Chi!!! Why fermenting is great for your gut. How to grow your own probiotic starter. How to successfully ferment your own Kimchi and vegetables. 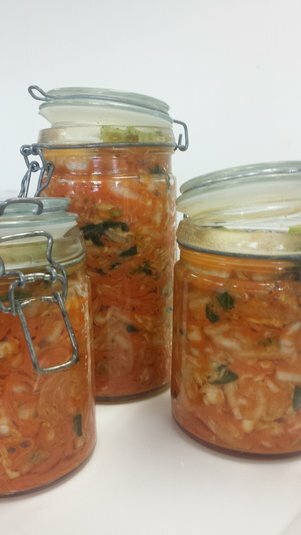 Get your hands into it and make your own probiotic starter and Kimchi to take home and enjoy during this morning workshop. Leave feeling confident so you can begin to be adventurous with fermenting vegetables in your own kitchen. I provide all the fresh produce, the starter (Kefir grains) and a work book with recipes. You are also able to take home what you make so you will be eating yummy Kimchi you made yourself and continuing to grow your own high potency probiotic each day.